Get your fixed (online) price from BOXT today – book an installation for Mon-Fri and get £200 off at checkout! Here we are going to cover the most common faults with Vokera boilers. Some faults have simple quick fixes but it makes sense to call out a qualified Gas Safe engineer to assess the damage and advise on the best route forward. Vokera are not known for being particularly reliable, but they are extremely popular. Why? Big name heating merchants and boiler installers use them as their budget option, so they’ve found their way into thousands of owned and rented properties in the UK. Just look at the incredibly short guarantees they offer. Many Vokera boilers only have a 2-year guarantee. In comparison, Worcester Bosch and Ideal offer 7-10 years on most of their range. Click on the common fault below to skip straight to that section. If the fault on your Vokera boiler has not been listed, please leave a comment and we will get back to you. Alternatively, get help, and free boiler repair or installation quotes here. And, if you’re thinking about a replacement boiler, we’d recommend BOXT (part owned by Bosch). They fit Worcester boilers for a similar price as a local installer would charge for a Vokera. They come with a warranty of up to 10-years, and you can get your price using this clickable form. Let’s start with the A03 error code. This code is particularly common on the Vokera Compact boiler range. The A03 code is showing the user that the problem with the fan. Quality fans will tend to outlast a lot of boilers. But, Vokera use lower end components in their products, so components like the fan are very likely to break before the boiler gives up the ghost. First, an engineer will need to diagnose what is wrong with the fan. In many cases, the whole fan unit does not need to be replaced. A common cause of the A03 fan error is just worn bearings. Spares kits can be purchased from heating spares suppliers and they are easily replaced. However, it’s worth asking the engineer to assess the situation of the fan, to check there’s not going to be issues further down the line. If there is, it would make sense to replace the whole fan whilst the boiler is apart. If the fan is moving freely, it’s possibly a wiring issue. Using a multimeter, an engineer can check to see where the voltage drops. The 40, 41 and A04 error codes are common on the Vokera Linea and the Vokera Compact. That said, this is possibly the most common issue with all brands of boilers; low pressure. Boilers that lack pressure, or are losing pressure will not work correctly. Worse though, is the fact there could be a leak in the central heating system. Topping up the boiler using the filling loop will likely get rid of the code, but it doesn’t solve the problem. Radiators, towel rails and radiator valves. Auto air vent in the boiler. Stop taps and gate valves. Do a quick check around all the above components and see if any are leaking. If they are, tightening them (extremely carefully) can sometimes fix the problem. Once you’ve found the cause of the problem, get it fixed with a replacement as soon as possible. Either the water isn’t getting hot, or it only gets warm when you’re heating is on? This boiler fault is most likely to relate to the diverter valve on the boiler. Unfortunately, the diverter valves on Vokera boilers (especially on the Flowmatic and Unica HE) are low quality and prone to failing. The diverter valve in the boiler is crucial. A combination boiler heats hot water as and when you need it. When you turn on a tap, it switches its focus from your heating, to heating the water. Once the tap is switched off, it flicks back its focus to your heating. It’s likely the diverter valve is stuck and not flicking to the hot water side. 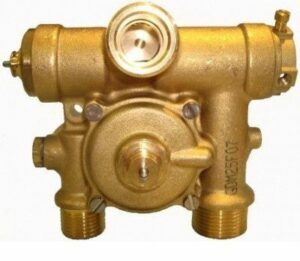 We’ve covered faulty diverter valves in more detail here. On many occasions, the whole diverter unit doesn’t have to be replaced, as the problem usually lies with the washers on the diaphragm. However, the cost of labour to disassemble and reassemble the boiler means that replacing the whole diverter valve is the best option. The replacement diverter valves on Vokera boilers are usually much cheaper than other brands (it does depend on the exact) model, so £250 should usually cover the whole cost of the repair. But, if your boiler is old and unreliable, it might be time to consider a replacement. You can get a guaranteed online price in less than 2-minutes here. If you have a Vokera Linea, you’re going to see a boiler fault code of 10. On the Vokera Compact, the A01 error code means the same thing. The boiler has recognised there is a fault with the boiler when it comes to ignite. This could be due to a few things. The most common cause is faulty ignition leads, or a gas valve not functioning correctly. However, in many instances, the issue is with the PCB. And that’s not good news. These units can cost up to £500 to replace. On an old boiler, it doesn’t make sense to invest this much cash, as it’s likely to develop more problems soon anyway. If it’s the PCB that needs replacing, it’s worth considering boiler replacement costs first. A Gas Engineer will first need to figure out whether the issue lies with the ignition leads, gas valve, or PCB. Once they determine the issue (usually by testing all circuits with their multimeter), they’ll be able to advise on the best route forward. Ironically, the 92, 93 and 95 fault codes that are displayed on Vokera Linea boilers relate to a problem most boilers will have at some stage; condensate blockages. The blockage is either going to be in the trap that’s in your boiler, or the pipe that lets waste out of the property. If it’s cold, go outside and check that the pipe isn’t frozen. As bits of debris build up, moisture collects. As soon as it goes below freezing, all this moisture (and debris) freezes and blocks the pipe. Use warm water to thaw the pipe work and try and remove any debris. If it’s not cold somewhere along the pipe there is a blockage, this is just debris in the pipe. Removing the pipe and flushing clean water through it will usually get rid of the blockage. If not, fitting a new pipe is an option (all plumbing merchants stock condensate pipes). Most of the common Vokera boiler faults can be fixed quickly and inexpensively. However, there are some faults (such as a broken PCB) that are just too expensive to fix. 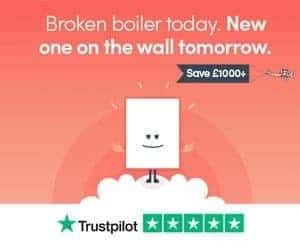 When a new boiler could save homeowners £200-300 per year on heating bills, and a fix could cost up to £500, sometimes the best option is a replacement. You can check the cost of a replacement here. If the fault on your Vokera boiler has not been mentioned, please leave a comment and we will get back to you.